I this post I'm going to deploy Xymon in amazon cloud ( AWS ) for off-site monitoring. Running “external” monitor in the cloud is efficient alternative for third-party services ( search for "External Website Monitoring" ). Easy installation, small footprint (no database) and flexibility of xymon makes it very attractive instrument for such project. Logon to AWS and launch the smallest instance ( t1.micro ) using Basic 32-bit Amazon Linux AMI. Make sure that SSH, HTTP ( or/and HTTPs ) connections are permitted in the security group. Get source code from repository ( or download archive from xymon.com ). OK, application is installed and can be started, but currently it will be checking localhost only and reporting to log files. Let's prepare front-end - Apache web server. as an example we cat test some Google sites, in future connection to google.com could be used as a "always up" service. Adding dependency allows avoid noise form hiccups on AWS network. Web interface is nice, trends, etc …, but what about alert notifications ? another - use any public e-mail provider who support smtp authorization. set realname="Xymon in the Cloud"
Long story, many steps, but in reality should take less then an hour to have basic monitoring running. Operational cost of this setup will be definitely lower then comparable services from “remote site monitoring” providers. Subscribe to the Xymon mailing list ( http://xymon.com/xymon/help/known-issues.html ) for friendly support, ask for help and give help to others. 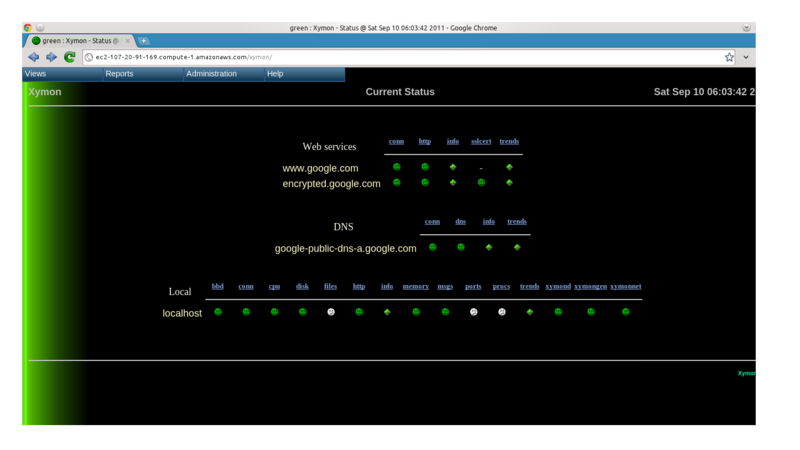 We have been using nagios for monitoring our instances in cloud but now definitely I'll give a try to xymon.